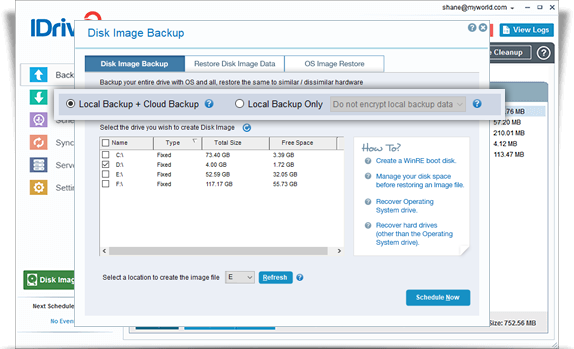 Follow the below steps to create disk image backup. Download and install IDrive on your computer. Log in to your IDrive account with Username and Password. Note: If you had set a private encryption key for your account, then provide the private key. Select Local Backup + Cloud Backup or Local Backup Only. Select the drive that you wish to backup. From the 'Select a location to create the image file' drop-down list, choose a local drive. Click Schedule Now. The Scheduler screen appears. 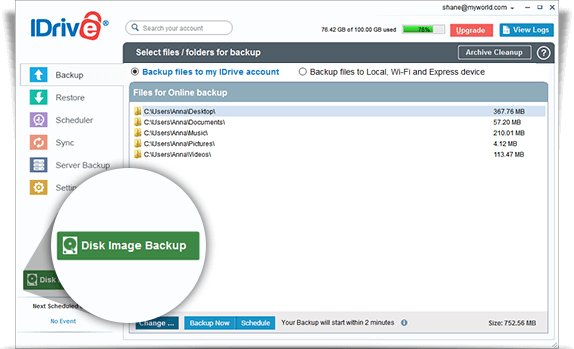 Create a schedule for performing regular disk image backups and click Save Changes. Click here to view Restore Instructions.